Now did you know up on the rooftop of Lot 10 in Bukit Bintang there is this nice romantic dining place called Teeq Brasserie? Well I for one did not, hence I was pretty pleased when invited last week to dine there together with some friends. With a rather nice green lawn in front of the restaurant, Teeq welcomes its guests with a wood themed decor, with a beautiful view of KL's skyline. Wed, Thurs, Fri, & Sat: 6.30pm - 11pm, serve snack menu after 11pm till 4am. "Teeq derives its name from the woody textures and earthy tones that make up this chic brasserie. An impressive entrance with an avant-garde decor. An all-glass facade offers you a grand view of Kuala Lumpur's skyline." "A dramatic landscape of cascading ferns and flora serve as a backdrop against the skies of Kuala Lumpur, while pristinely manicured lawn serves as an outflow for outdoor parties right outside the brasserie. 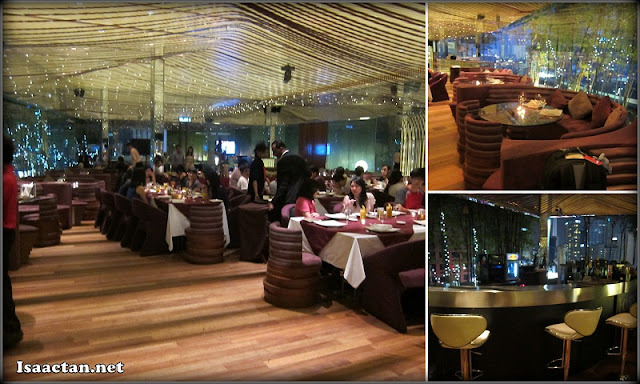 Teeq offers a fine selection of Japanese and Thai to Asian and Western delicacies with a metropolitan twist." We kicked off the night with some greeneries in the form of Teeq's Highland Greens salad. It came as a Classic Caesar salad with croutons, beef bacon, parmesan cheese, cherry tomatoes and caesar dressing. It was okay, not exactly to my liking though as i would have preferred the meaty bits to be crunchier. Still a good appetizer to whet our appetite for more good food to come. Seemingly unassuming and mild, the Sea Water Prawn dish surprisingly happened to me one of my favourite dish for the night. Deep fried in carbonate soda batter, the sea water prawns were seasoned perfectly. I love the crunchiness of it all, coupled with the fresh "no sea smell" prawns, dipped in cucumber mint yoghurt, I could not get enough of this finger food. Strangely named Cappucinos, their Mushroom soup were unique coated with milk foam and served in these cute coffee cups. We could actually drink it from the cups like what we would for a cup of cappuccino, hence the name. The prices at Teeq Brasserie was surprisingly okay, considering it's ambiance and environment. We had their Con Fungi, a mushroom pasta which again was done just the way I like it. For those who love the aroma of forest mushrooms, this dish is a must-try. Maryland Chicken, Teeq's styled rost chicken with beef bacon, mozzarella cheese had a rather unique taste to it. All this while I actually thought Maryland chicken was this bread crusted deep fried chicken, but here's a different version of the Maryland Chicken. Served with a heavy load of mash potatoes and market vegetables, this dish was okay, although I would have proffered the thigh part instead of the breast. Fish lovers rejoice, as you can enjoy this dish called the Salmon Trout consisting of pan-fried salmon with leek potato puree and stir fried zucchini. I'm not a big fan of seafood though, but from the little that I had, it tasted rather good. Save the best for last, that's what I always hear, and here the best for me came in the form of Teeq's Short Ribs offering. Fire roasted bone in short ribs, the meat itself actually melted away the moment you put your knife to it. Dipped in their special BBQ-like sauce, it just wasn't enough for the five of us that night. Fortunately that wasn't the last dish, as another great tasting dish came up below. Being a burger lover, Teeq's home made char grilled beef patty really was so juicy that we actually ordered 2 mroe servings of their BBQ Ali Burger. Served with melted cheese, Tomato and fried egg, one must not say no to this delectable dish. Even the mayonnaise laden veggies tasted nice. We ended the meal with some sinfully sweet desserts. One of them being the Snicker Bar dessert consisting of Snicker Bar-like ingredients, peanut butter mousse and chocolate ganache. Give me a few more of it, I said, thank you very much. Overall it was a nice dinner over at Teeq Brasserie Rooftop Restaurant, a nice spot which I did not even knew existed until last week. The grand opening of Teeq Brasserie was actually on 14th October 2009. Do drop by this restaurant on the rooftop of Lot 10 should you be in the vicinity of Bukit Bintang. jellyyyy.... y u always eat nice foodddd.... and reading your post at the middle of the night is very torturing. That certainly is a nice place, food looks good too. Rooftop some more. Will certainly check it out when I go to KL again, should I be staying in the vicinity like I usually do. Wowww looked delicious! I want 'em all! The food are very well presented. The prices are not overly expensive.. I actually went there for gym about a few years ago, totally fall in love with the rooftop environment yet didn't get to try Teeq as it seems so "atas" xD. Surprisingly the price was quite affordable! Thank you for the recommendation! I would definitely try the Con Fungi as mushroom lover!